ROAD is a service offered by the ISSN International Centre with the support of the Communication and Information Sector of UNESCO. ROAD counts as of today 19,157 records, while the ISSN Network has assigned more than 1.9 million ISSN. The ISSN Network identifies and assigns ISSN (each day worldwide) not only to scientific sources but also to newspapers, magazines, websites, annual reports and many other types of publications without any scientific content. The publishers who apply for an ISSN are requested to follow a standard procedure available on the website of the ISSN International Centre. 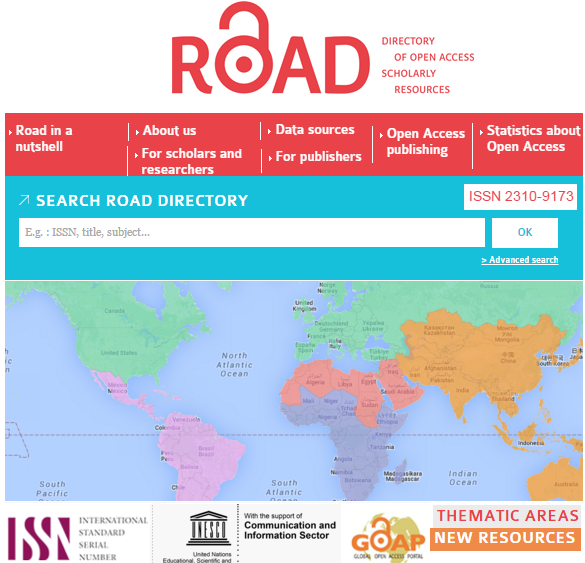 This latter, with the support of the Communication and Information Sector of UNESCO, launched (on 16th December 2013) the beta version of the Project Directory of Open Access scholarly Resources (ROAD). In July 2013, the ISSN International Centre has started to identify Open Access (OA) scholarly resources among the 130,000 online resources to which ISSN numbers have been assigned (an ISSN to one resource and only one) by the ISSN Network since the end of the 90’s. This retrospective identification has been continued and completed in 2014. Since 2014 ROAD has been extended in terms of the coverage and additional features. (4) demonstrate new ways of using the ISSN for compiling bibliographic information from various sources. ROAD provides a free access (under CC BY-NC 4.0 license) to a subset of the ISSN Register (1,9+ millions of bibliographic records). 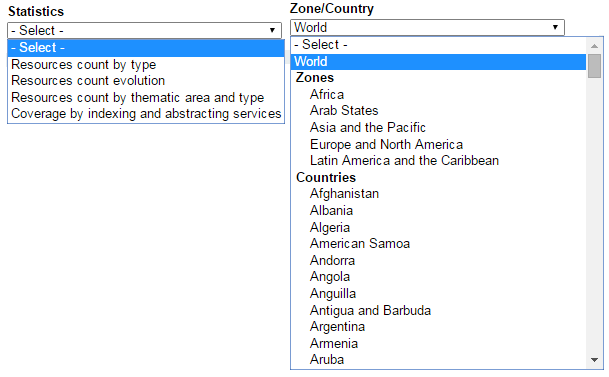 This subset comprises bibliographic records - created by the 89 ISSN National Centers and the ISSN International Centre following the cataloguing rules of the ISSN Manual – that describe scholarly resources (journals, conference proceedings and academic repositories, monographic series, scholarly blogs) in OA. (3) matching ISSN records with coverage lists provided by indexing/abstracting databases, registries and journal indicators. By assigning an ISSN, the catalogers of the ISSN Network certify that a given publication is a continuing resource and provide the basic metadata for its identification (title, publisher name, place of publication, URL, frequency, the resource is indexed by..., is abstracted in..., citation databases, registries and journal indicators, etc.). ISSN data can be downloaded in RDF and MARC XML. Every month, ISSN records are matched (thanks to the ISSN numbers) with coverage lists provided by indexing/abstracting databases, registries and journal indicators (EconLit, PsycINFO®, Scopus, Catalogo (Latindex), DOAJ, The Keepers Registry, SJR, SNIP, ATLA Catholic Periodical and Literature Index®, ATLA Religion Database®, CAB Abstracts, CAS SciFinder®, GeoRef, Global Health, Linguistics Abstracts, MEDLINE®, PubMed Central® (PMC)). ISSN records are automatically completed by the mention "covered by" or by indicators when the matching is positive. The following criteria have been established for selecting the resources: OA to the whole content of the resource (free registration is accepted); no moving wall; the resource comprises mainly research papers; the audience is mostly researchers and scholars. The geographic, disciplinary and linguistic coverages of ROAD aim to be comprehensive. The ROAD statistics provide an overview of the production of OA resources worldwide. They are computed through automatic searches against the ROAD database. (4) coverage of the resources by indexing and abstracting services. Unpaywall : find open access versions of paywalled articles! Use oaDOI link and find an open version of the article! Biology Research Network BioRN is launched : get involved !